Saturday February 2 2019, 8:00 pm. 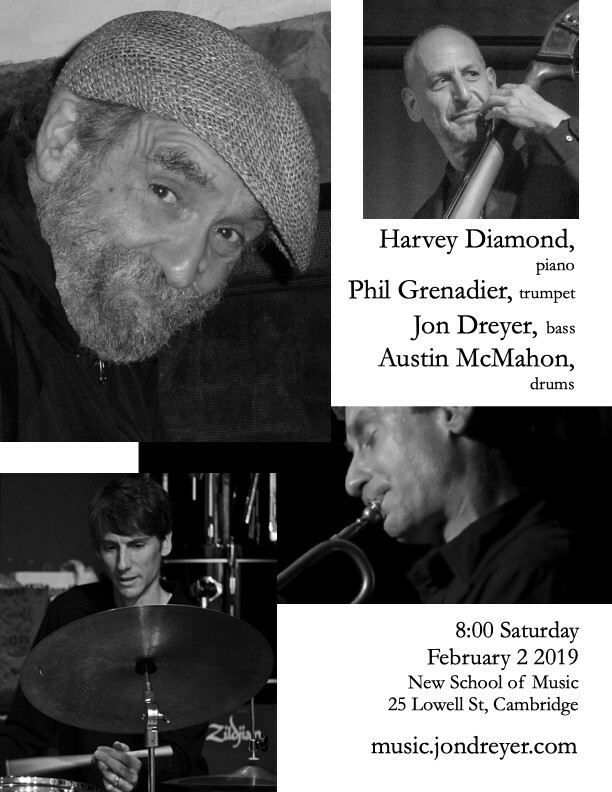 The Harvey Diamond Quartet featuring Harvey Diamond, piano; Phil Grenadier, trumpet; Jon Dreyer, bass; Austin McMahon, drums. At the New School of Music, 25 Lowell St, Cambridge MA. Walk from Harvard Square, take the #71 or #73 bus, or park free in the lot behind the school. Tickets https://www.brownpapertickets.com/event/4058445 or at the door. Throughout a career that spans nearly three decades, trumpeter Phil Grenadier has emerged as one of jazz’s most imaginative and innovative players. His two albums as leader, 2000’s Sweet Transients and 2003’s Playful Intentions , have won him copious international acclaim, while his collaborations with a broad array of notable musicians demonstrate the raw talent and adventurousness that led the San Jose Mercury News to call him “a trumpeter of rare fluency and depth.” He has performed with Ella Fitzgerald, Mel Torme, George Shearing, Tony Bennett, Carlos Santana, James Brown, Sammy Davis Jr., Dionne Warwick, Bob Belden, Richie Beirach, Ethan Iverson, Bill Stewart, Kurt Rosenwinkel and Jeff Ballard, Steve Swallow, Kenny Barron and countless other greats. Bassist Jon Dreyer is one of Harvey Diamond's closest collaborators. He also performs regularly with James Merenda, both as a member of his high-energy, jazz-ish band TickleJuice and also in more mainstream jazz settings. He has performed with NEA jazz master Sheila Jordan as well as most of the Boston jazz community, including George Garzone, Jason Palmer, Adam Janjigian, Yoko Miwa, Frank Wilkins, Dominique Eade, Bob Gullotti, Joe Hunt and Steve Langone. Drummer Austin McMahon performs regularly with Jerry Bergonzi’s Quartet and has recently performed and/or recorded with Sean Jones, George Garzone, Joe Lovano, Lionel Loueke, Ben Monder, Lage Lund, Kate McGarry, Noah Preminger, Jason Palmer and Grace Kelly. He has appeared as an opening act for Grammy award-winners Dianne Reeves and Esperanza Spalding. McMahon is the winner of the 9th annual Independent Music Awards for Jazz Song Category and Nominee for Best Jazz Album in the 11th annual IMA's. His debut CD Many Muses was selected as a CDBaby Editor’s pick and described as "subtle, reverential to tradition, and thoroughly new." He was recently featured on NPR JazzSet with Dee Dee Bridgewater, WLRN Miami (NPR station) and live on WGBH radio, Boston, MA. Austin is also the co-founder, producer and recording artist for the burgeoning record label Fractamodi and has recorded on over forty commercially released albums in the past several years.